The prosthetic rehabilitation program includes empowering you with knowledge, information and choices. You need to be an integral part of your prosthetic program. It is important that you feel free to express your feelings and ask questions. Initially you will only wear your prosthesis with a certified physical therapist who will instruct your prosthetic usage. Under the supervision of your prescribing physician, the clinical team will coordinate your progress.​ Our goals are to reach your maximum capability. Learn to use and care for your prosthesis. Use shrinkers to reduce the size of your residual limb. Maintain comfort with your prosthesis. Walk all day or to your maximum capability. A successful program will maximize your residual limb shrinkage, skeletal changes, muscular changes, balance and prosthetic performance. We want you maximize your goals in your preparatory program and we strive for minimal changes when your definitive prosthesis has been made, to ensure a well fitting and long lasting prosthesis for you. You and Jake will work together so that you will be able to perform the daily tasks, activities and hobbies that you enjoyed prior to amputation. It is important to learn to control limb swelling and shrinkage. There are certain techniques that will help to begin the process of shaping your limb to fit into a prosthesis. Your surgeon may prescribe a compression wrap or shrinker sock. These techniques will assist you in controlling the edema (swelling) from the amputation and will assist with the atrophy (shrinking of the muscles) of you residual limb. ​Initially exercise will help reduce the edema in the residual limb and will prevent muscle contractures. Over the long term, muscle strengthening through exercise , will help you walk without a limp. In general, the stronger you are , the easier it will be for you to walk with your prosthesis. "Good communication is essential for a successful prosthetic program. You can make measurable progress in your prosthetic program with personal dedication, good communication and the commitment of the prosthetist." To help reduce the swelling that naturally occurs after an amputation. Swelling is reduced by containing the limb within a well fitted socket and through the pumping action created by walking. To get you up and walking as soon as possible. To help the amputation site heal. 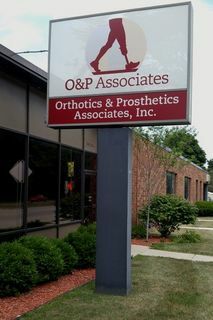 To train you to use your prosthesis. To improve your balance and control in using your prosthesis. To assist you in returning back to a more independent life. ​​During the initial fitting, Jake will guide you in the basic principals of using the prosthesis, fine tuning the fit and alignment as needed. Although Jake will, by necessity, be the first to offer initial training with the prosthesis, the majority of the training will be accomplished under the direction of a physical therapist. This includes simple shifting of your weight from one leg to the other, to walking between parallel bars, managing daily activities such as, bathing, walking on different terrains, stair climbing, and getting in and out of an automobile.